Wondering what to do with that beautiful old theatre that is now surplus to requirements? Why not put a bookshop in it! Obvious, really. And that’s exactly what they did with what was once the Teatro Gran Splendid on Avenida Santa Fe. The interior is gorgeous, making it quite probably a worthy recipient of the No.2 spot in The Guardian’s list of the world’s best bookshops (not having been to any of the others, it’s hard for me to say). The café and reading area on the old stage at El Ateneo is a particularly nice touch. There aren’t many books in English, but leafing through a coffee-table book is a nice way to pass half an hour or so over a…coffee (what else would you drink with a coffee-table book?). Particularly if your guest or guests have never seen a mausoleum-style cemetery, the famous Recoleta Cemetery is truly impressive and well worth a visit. The opulence on display makes it obvious that the people interred here were extremely wealthy, as no expense was spared on their final resting places. One oddity about Recoleta Cemetery is the 40 or so very well-fed looking cats that inhabit the place. Are they sneaking into mausoleums and feasting on human remains? One can only guess. To make your Recoleta Cemetery visit really special, why not play tomb photo scavenger hunt? It works like this: everyone takes a digital camera (a phone camera will do) and gets a list of five different famous people who are interred in the cemetery (there’s a full list here). First one who makes it back to the entrance with photos of all of their mausoleums wins! ‘MALBA’ is the premier modern art institution in Buenos Aires. The building itself is stunning: all acute angles on the outside, and inside there’s a beautiful light-filled atrium with an escalator connecting the three floors. Art-wise the permanent collection features work by people like Frida Kahlo, Diego Rivera, Xul Solar and Tarsila do Amaral, among others. Also great is something called Enredamaderas, by Pablo Reinoso, which is essentially two wooden slat benches on different floors of the museum connected by long strands of wooden spaghetti (!). It’s at the museum until December 2010. You can comfortably get around MALBA in about two hours, and there’s a nice café on the ground floor where you can get a post-art sandwich. So there you go: three places that your out-of-town guests will no doubt enjoy. 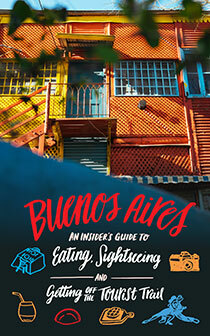 Throw in a steak dinner and maybe a tango show and you’ll be looking like a Buenos Aires expert in no time! 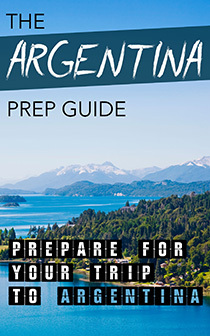 Fantastic suggestions for my fave city in the world, esp Recoleta Cemetery. I’ve been there at least 3 times and it never dissapoints. Great photo ops there! Thank you for sharing these suggestions! I’m studying Argentina in one of my classes, and I’d love to know how the culture has changed and how it is still changing. If I could have more information on the popular art, music, and social events in Argentina that would be great! Thank you!